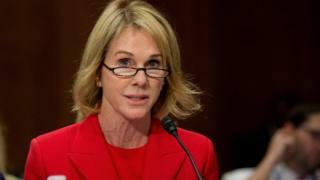 President Donald Trump has announced that he plans to nominate Kelly Knight Craft for the country’s vacant post of United Nations envoy. Ms Knight Craft is currently the US ambassador to Canada. She will replace Nikki Haley, who resigned last year. In two tweets announcing her nomination, the president congratulated her and said she had done an “outstanding job” in her current role. Mr Trump’s first pick, Heather Nauert, withdrew her candidacy last week. The former Fox News presenter said she made the decision for family reasons after a “gruelling” two months in the spotlight. ….Kelly has done an outstanding job representing our Nation and I have no doubt that, under her leadership, our Country will be represented at the highest level. Congratulations to Kelly and her entire family! Nikki Haley congratulated Ms Knight Craft shortly after the president’s online announcement. “She’s done a great job representing us as @USAmbCanada and we know she’ll be a strong voice for America at the United Nations. #USstrong,” the former ambassador said in a Tweet. Secretary of State Mike Pompeo has also issued a statement praising the nomination, saying he was “very pleased” with the choice and said he looked forward to working with her at the UN. US media reports say the role will probably be downgraded from the Cabinet-level position it was during Ms Haley’s tenure. Ms Knight Craft has to be formally nominated and approved by the US Senate before she can assume the role. Who is Ms Knight Craft? The 56-year-old is currently serving as ambassador to Canada after being nominated by President Trump in 2017. She is the first woman to ever hold the post. Ms Knight Craft made headlines shortly after she started the job, after she told a Canadian broadcaster that she believed scientists on “both sides” of the climate change debate. She has also been a strong backer of the US-Mexico-Canada Agreement – pioneered by President Trump as a replacement for the North American Free Trade Agreement (Nafta). Ms Knight Craft previously served as an alternate delegate to the UN during President George W Bush’s administration, where her focuses included Africa. The Kentucky native has been married to billionaire coal mining businessman Joe Craft since 2016. The couple are both long-term and generous donors to the Republican party. Mr Craft donated at least $1m (£770,000) to President Trump’s inauguration fund, according to Open Secrets, a non-profit group that tracks political contributions. ← How are MPs deselected?